I vote we all do this! Who’s with me? So, another week and weekend has passed. January is coming to a close. I keep thinking I should have accomplished a lot this month but as I look back, my mind goes blank. Ah well. In a look back at last week, there are a few things that stand out. First, Lawyer Guy’s old iPhone 5 finally died, for all intents and purposes. He now has an iPhone 8 and during the switchover, he changed up our internet and cell plans, saving us some money each month, plus discovered that U-Verse TV is finally available in our neighborhood! If I had a cheerleader emoji, I would enter it here. I’m too lazy to go look for one. Anyway, I can’t wait for the new TV source, even it means relearning favorite channel numbers. I did get some words written on MONTANA MOON though mostly snippets under 1K at a time. I need to up the effort. Big time. I also figured out the story line for UNDER THE ASSASSIN’S MOON, which will be my 5th entry in Susan Stoker’s Kindle World. The heroine is a spy agency assassin, the hero a Delta Force guy, and there’s a little Indian girl in Brazil who brings them together. Remember Siri from ASSASSIN’S MOON? Reading has been a lesson in not much exciting. I had contest books, a new book I’d been eagerly awaiting, and a heretofore un-listened to series by a favorite author. Nothing bad. No DNFs in the bunch but nothing that made me jump up and down to recommend and give 5 stars to. I want something to catch my imagination. Pitcher/catcher is just around the corner and with the new U-Verse package, I’ll get to watch all the spring training games that the Cardinals televise so yay! I didn’t get last season’s Game of Thrones watched but that’s okay. I can pick it up off Amazon or On Demand when I’m in the mood. Thing is, I haven’t really been in the mood for TV lately. Like my reading, nothing has lit my imagination on fire. Blerg. I’ve enjoyed teaching the on-line class in magic realism this month. Wednesday is the last day and I’ll miss the research, and the class comments and interaction. Did I mention that 1099s are coming in? Yeah…depressing. Moving on. So, goals this week: Clean 1 room. Write 1600 words a day. Try a new recipe (to get us out of an eating rut). Learn how to work the new TV technology. And I think that list just exploded my brain! Maybe I’ll just find a good book and read instead! 😉 What’s on your to-do list? This entry was posted in Writing Life and tagged follow up, Kindle Worlds, Monday, procrastination, reading, stuff, TV, writing. Bookmark the permalink. Yay for the new TV provider! I know your old one has been a pain in your buns for a while now. Yay for writing! And Siri! And upcoming baseball! Coffee. I have the day off the other job because Mom is hip-deep in other stuff today – unless she needs me for something, then I’ll work. Otherwise, I have today to get EG editor-worthy so I can start on the Blink final edits tomorrow. Nothing else on my plate or my brain until that’s done. Except coffee. Lots and LOTS of coffee! 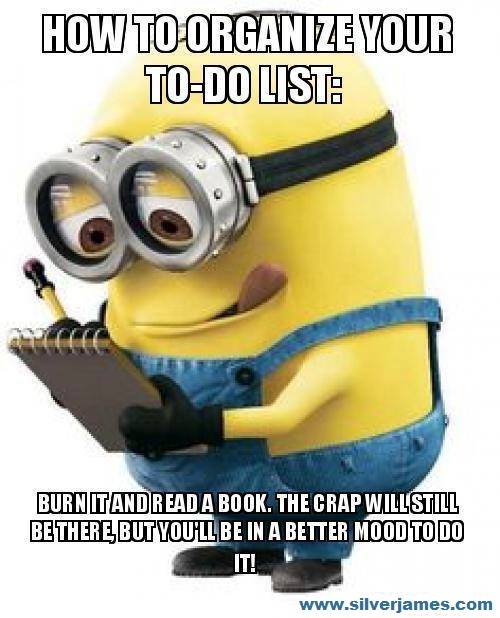 I can’t really burn the to-do list either but that’s okay. I need to get some stuff out of the way before the tech guy calls to say he’s on his way. I shouldn’t be so ridiculously excited, especially given that we thought we were getting Direct TV (as a precursor to U-Verse) way back last year and then they said we’d have to chop down a tree so the satellite dish could connect with the satellite. This one should go without a hitch but I’m not doing final erasures of the DVR until the new service is up and running! Now grab another cup of coffee and get to work! I want to read your books!!! Early Grave is in JC’s hands now. And I’m hitting Blink tomorrow. I need the night off. I hope your TV thing went well today. It did. Mostly. Somehow in the change-over our landline was cut. Hopefully, the tech coming tomorrow to upgrade the internet connection can fix it. Yay.